Aso Kanko Hotel, c. 1960. “The Aso Kanko Hotel (Aso Sightseeing Hotel) has been an urbex legend for many, many years. Japanese bloggers were excited about its size, its beauty, its famous former guests – and after the abandonment: its security and its function as a movie set. “The Aso Kanko Hotel was opened in July of 1939, in Kumamoto, at the foot of volcanic Mt. Aso, built with government funds. It made quite a splash those days as it was designed to be a Western style hotel with several features very unusual in Japan at that time, like a revolving door, flushing toilets, a Western style bath and a big dining room with a bar. After World War II ended, the Aso Kanko Hotel, much like the gorgeous Maya Tourist Hotel, in Kobe, was used by the American forces for rest and recuperation. 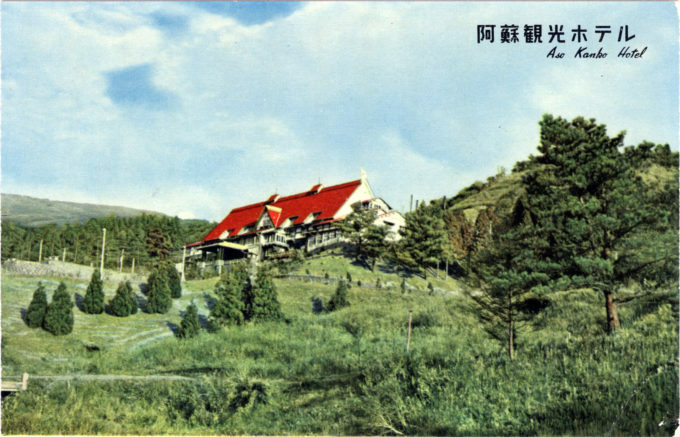 “When the American military occupiers left, the Aso Kanko Hotel was taken over and renovated by a predecessor company of today’s Kyushu Industrial Transportation Holdings Co., Ltd. – a move that lured one of the most controversial people in Japanese history to visit the hotel: Emperor Hirohito, who apparently liked it so much that he came back twice in the following years, making the hotel one of the most famous ones in all of Japan. “On July 9th 1964, 3500 square meters of the hotel, including the lobby, went up in flames. No one was killed, but an exhibition of paintings by Ebihara Kinosuke were victims of the fire. Renovations took a whole year. After reopening, the complex of three main buildings and several annexes continued to thrive and quickly became the most popular summer retreat in all of Kumamoto. But, as the complex grew older, it became less popular. In December of 1999 it was decided that the Aso Kanko Hotel would cease operations and close in February 2000. “Motor Road to Mt. 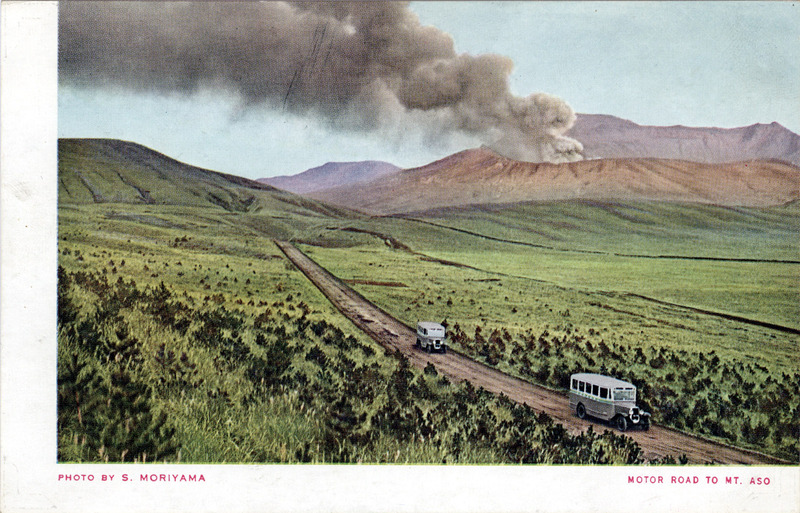 Aso,” c. 1940.